- All the Trappings of Home and So Much More. Edd and Rita Vowels never dreamed of owning a golf course. The Louisville natives relocated to Florida to live in the Sunshine state and raise their three young children. Both went to work for the McDonald's Corporation in Sarasota. After 11 years, working his way up the internal hierarchy of the company in nearly every facet of the organization, Edd an Rita had the opportunity to purchase their first franchise in Bradenton. Fast forward to 2009 and the Vowel have just retired after 42 years with the McDonalds Corporation. Now it's time to start traveling in their RV, visiting and exploring the Smoky Mountains. They also spent a lot of time in the Sebring area and frequented Spring Lake Resort. Spring Lake Resort is located just outside of Sebring, FL and borders Lake Istokpoga, Florida's 2nd largest freshwater lake. 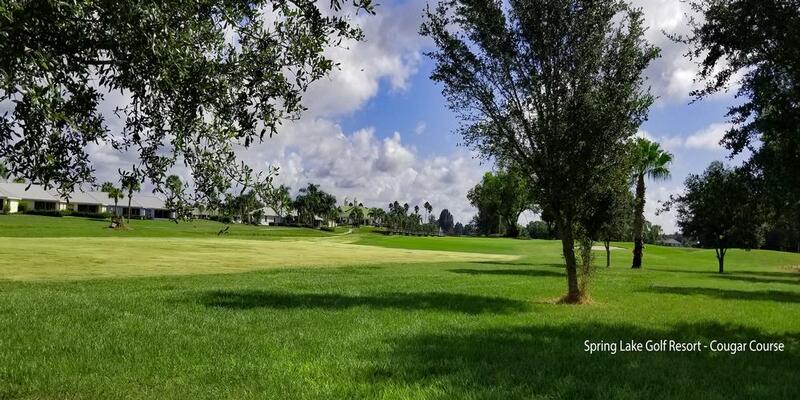 A lot of the area around Spring Lake has remained largely undeveloped however you're never too far from shopping, movies, a dinner theater, bowling, or the world famous Sebring International Raceway as well as other recreational activities. 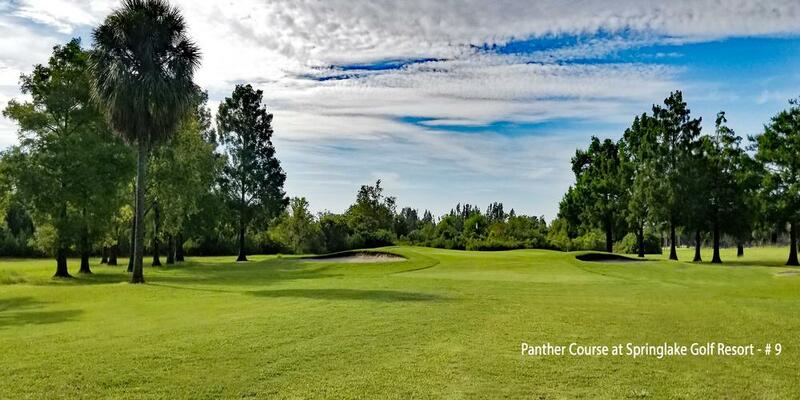 The major attraction at Spring Lake Resort are the 45 holes of golf: Panther Creek and Cougar Trail are 18-hole championship layouts while Bobcat is an executive length 9-hole course. 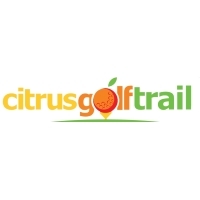 Bobcat is one of the most popular courses in the area and tee times can be tough to come by during the winter "Snowbird" months. All of Spring Lake's courses have well-groomed fairways and greens which help keep them difficult yet friendly. Spring Lake's friendly staff can offer tips on what you'll need to do to play your best round. Of the two regulation tracks, Panther Creek is much longer. 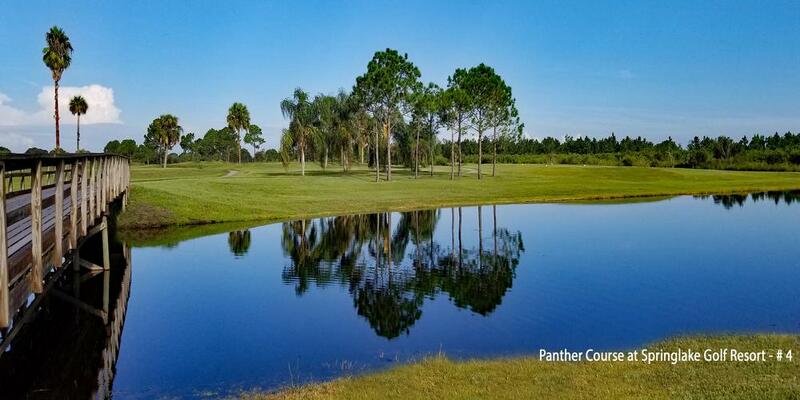 In fact, at 6,757 yards from the back tees, Panther Creek plays over 1,300 yards longer than Cougar Trail. Back in the day, each course had its own distinctive trademark: Panther Creek's 4th hole is a 758-yard par 6 (yes, 6) dogleg left. Outside of the length, the hole is further complicated by a couple of fairway bunkers on the left that can easily come into play off the tee and on your layup shot. About 250 yards from the green, a lake comes int play on the left side, while another greenside bunker on the right collects other errant approaches. For some it's a driver, two 3-woods and a wedge to get there for others it's a variety of combinations. Whatever your score, it's a hole you'll long remember. Panther Creek offers six different tees to choose from and water comes into play on all but one of the holes. There's also a par 3 with an island green. Once upon a time - before the course underwent some extensive remodeling - the green on the par three 9th hole on Cougar Trail was the largest putting surface in the world, visible from the moon! OK, I made that last part up. Actually, the green made the Guinness World Records for the World's Largest Green at over 47,000 square feet; it was over 100 yards deep! Hitting the green was easy; two putting - now that's another story. As maintenance costs began to skyrocket, the green was repurposed, one of which is the large practice green you now find behind the clubhouse. As you stand on the tee, look at the green and look at the practice green. Now imagine everything in between being part of the green as well. You get the picture! Even though at first glance Cougar Trail is a short course (5,443 from the back tees) don't let that fool you. First of all, it's a par 70. Secondly, the course is full of doglegs. Third, there's water on every hole and finally, the greens are much smaller - even Number 9! Oh, and there's a lot more undulation in them too. Inside the clubhouse, you'll find Shanker's Pub and Victoria's Restaurant. Shanker's offers a light daily menu including fresh deli and BBQ Sandwiches, hot dogs, danishes, muffins, and egg sandwiches. After your round, stick around and watch your favorite team on one of many big screen televisions; it's the perfect place to be for relaxing with your friends. Victoria's is a full-service restaurant with a full bar and is open to the public. They feature "casually elegant dining" in a setting that overlooks the golf course and canals; there's also a deck with outdoor dining. The menu ranges from pasta dishes, to steaks and seafood. Victoria's is open for breakfast, lunch and dinner and is a great place to host your next wedding or event. It's a great place to eat after a long day on the course. One of the nicest aspects of Spring Lake Resort is the Stay and Play component and they have put together some really budget-friendly packages. Accommodations consist of spacious, privately owned villas that are all fully furnished with two or three-bedrooms. Many feature screened-in lanais, full kitchens, living rooms and laundry facilities. A variety of bedding configurations are available and some units are also pet friendly. Rates change every season so it's best to call or email. Don't worry, they'll take good care of you. 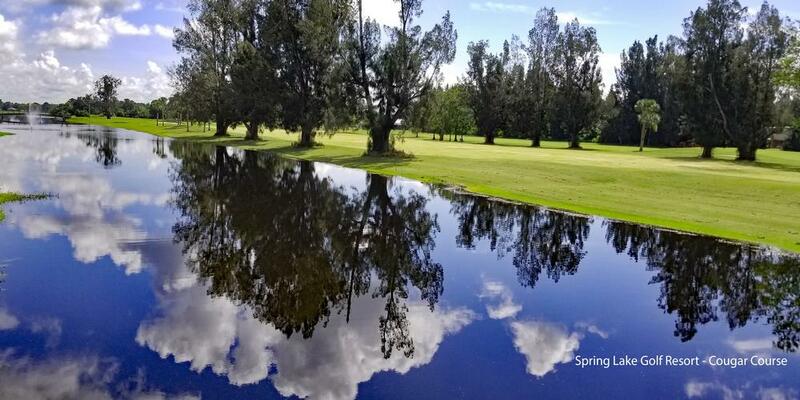 Spring Lake Golf Resort Centrally located in the historic town of Sebring, you'll find a combination of a great climate and small-town atmosphere. 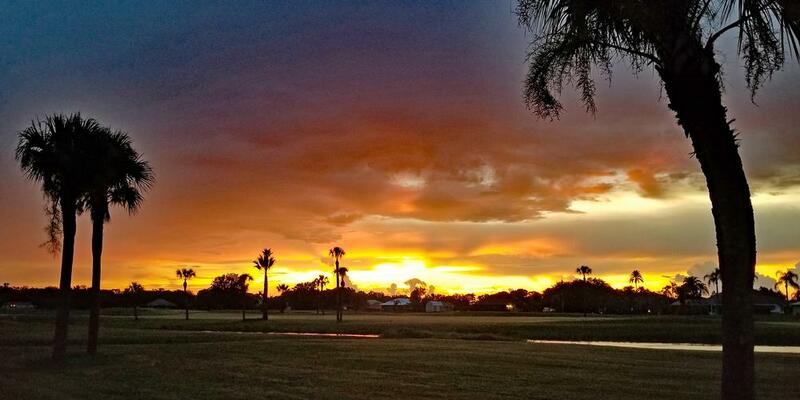 Spring Lake Golf Resort in Sebring Florida is out to make a statement about what a Florida golf resort should be and offers some of the best lodging and golf package values in Florida.. If you're not looking for the glitz and glam of a high end, posh golf resort, but instead are looking for accommodations that remind you of home, along with good golf and great food, then the Spring Lake Golf Resort should at least be on your list of resorts to consider this winter. And, if you're looking for more of what Florida's famous for, you'll be within striking distance of the Orlando theme parks. It's also a little over an hour from both the Gulf and Atlantic beaches.